An intersection is said to be “controlled” when access to the intersection is regulated by traffic signals or road signs, while access to an uncontrolled intersection is regulated only by the right-of-way rules. You must remember that traffic signals do not completely resolve traffic conflicts and you must learn to combine traffic signals and the right-of-way rules to avoid hazardous situations. A good example of a conflict that is not resolved by traffic signals is a vehicle making a left turn at an intersection with a green signal activated while an oncoming car is traveling straight through the intersection. The driver cannot complete the turn without yielding to the oncoming vehicle first. Most of the intersections with large volumes of traffic are controlled by traffic signals that are supplemented with road signs to maintain a steady flow of traffic. Never assume you have the right-of-way even if you are entering an intersection on a green signal, you must give way to all vehicles that are already at the intersection before going through. Always look left and right at an intersection, even if other traffic has a red light. A green traffic light indicates that you may enter the intersection if there are no other vehicles at the intersection right now. 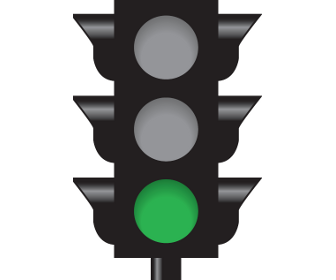 When making a right turn on a green signal, give way to pedestrians crossing the street. If you are turning left, give way to oncoming traffic and pedestrians crossing the street. 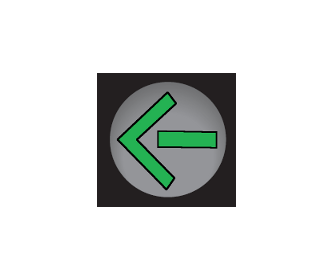 A green arrow allows you to make a turn in the direction the arrow points. When making a turn on a green arrow signal, your turn is “protected” and all other traffic moving through the intersection must yield to you. A steady yellow signal warns you that the traffic signal is about to change and a steady red signal will appear soon. If you are traveling towards the intersection and a yellow light is on, you must slow down and prepare to stop, if it is safe to do so. However, if you are already within the intersection or stopping rapidly may place you or other road users in danger, proceed through the intersection without stopping. 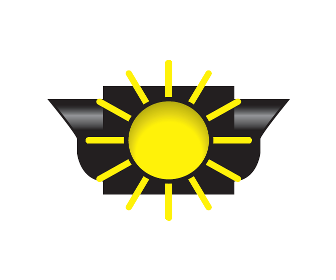 A flashing yellow signal means CAUTION and while you are not required to come to a complete stop before going through the intersection, you must slow down and watch out for other traffic. A steady red signal requires you to come to a complete stop and yield to all other traffic and pedestrians. If you need to make a left turn or travel straight through the intersection, you must remain stopped until the traffic signal changes to green. You are allowed to turn right on a red signal if there is no “NO TURN ON RED” road sign at the intersection. 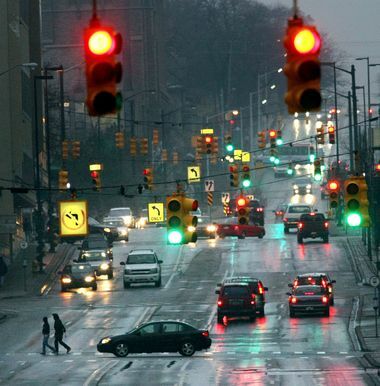 When making a right turn on red traffic signal, you must come to a complete stop and yield to all traffic and pedestrians crossing the street. 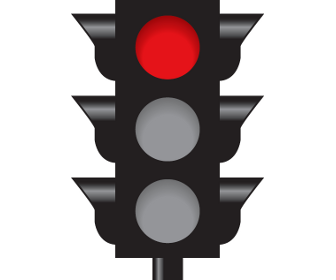 A lighted red arrow is not a common traffic signal for some states, but you should know it nevertheless. Drivers are forbidden to travel through the intersection in the direction the arrow is pointing. A flashing red signal has the same meaning as a “STOP” sign. You must stop completely and wait for pedestrians and cross traffic to clear the intersection before you go again. An intersection with a non-functioning traffic light must be treated as a four-way stop intersection. You must come to a complete stop and yield to other vehicles that arrived at the intersection before you. If two vehicles arrived at the intersection at the same time, the driver on the left must yield to the driver on the right. Intersections with low volume of traffic usually do not require a traffic light and are controlled by road signs. “STOP” sign and “YIELD” sign are usually employed for prioritizing directions of travel and help drivers make quick decisions about the right-of-way. When you approach an intersection and you see a “YIELD” sign before the intersection, you are driving on an unprotected route. You must slow down and yield to pedestrians and approaching cross traffic. Although the law does not require you to come to a complete stop, you may have to do so to let cross traffic pass. When you approach an intersection with a “STOP” sign, you must come to a complete stop and yield to pedestrians crossing the street and cross traffic. You have to make sure the intersection is clear and you will not impede approaching traffic by entering the stop-controlled intersection. A four-way stop intersection has stop signs installed at every entry to the intersection and is usually marked by the “FOUR-WAY STOP” sign. You have to stop before the intersection no matter what direction you are coming from. The vehicle that arrives at the intersection first has the right-of-way and must go first. When two vehicles arrive at a four-way stop intersection at the same time, the driver on the left must yield to the driver on the right. If traveling from opposite directions, both vehicles can proceed.